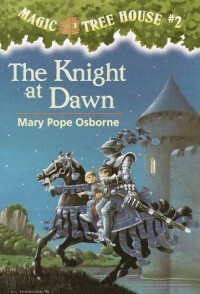 The Knight at Dawn is a Magic Tree House Book. This book is very easy to read and interesting for many children. Jack and Annie go back to explore the magic tree house after their first encounter with going to dinosaur times. They end up going to a castle and getting into different situations while exploring this new place. I would put this book in my classroom library. I think this would be a great book for students to read to themselves.